In Romans 13, Paul tells us that our greatest debt must be the debt of love to others. Last week, Paul turned our attention to government that we might give to it what we owe. This week, we look at our neighbors to see what is owed to them. 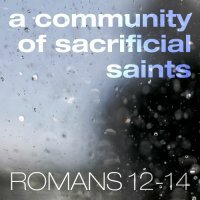 Paul tells sacrificial Christians that we owe them love. We are bound to love our neighbors by the law! The demands of loving our neighbor are great, but there is more than enough sacrificial love available to us in the mercies of God. Love is not to be a part of your life, but all of your life. Love is to be the law that we live our lives by! Today, would you prayerfully ask God to grow you in your love for your neighbor? Pastor Lukus has given you several questions on the next page to help you apply the truth of the gospel to this issue. Let’s live the gospel, channel grace, and be the church this week! Our plenty in twenty from 10:00am-10:20am. 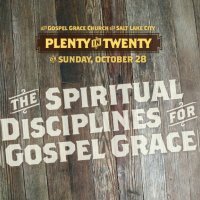 This week, we dove into the Spiritual Disciplines for Gospel Grace. We began breaking down how we can all become Gospel Grace Church. That can only happen as we submit ourselves to the patterns that God uses to grow us. Discipline yourselves for the purpose of Godliness! Paul will continue to expound the sacrificial response in view of the active pursuing mercies of God. The next response is that Christians submit to authority, because every authority ultimately comes from God. Therefore, to submit to God, we must submit to every human authority. The good news is that as God changes us more and more into a sacrificial community, we are able to see His hand in authority. We believe that the freedom found in knowing the love of God teaches us to live in humble submission...even to sinful authority. As a Christian, our whole being can be transformed with the truths of the gospel, so that we can submit to any earthly authority. Would you honestly and prayerfully look at your submission? Several questions are on the next page to help you apply the truth of the gospel to this timely issue. Let’s live the gospel, channel grace, and be the church this week! Today, we turn our attention back to the various aspects of authentic love that Paul has been laying out in Romans 12:7-21. In Romans 12:17-21, Paul shares with us that Christians overcome evil done against them with good from the gospel. When we know that God's wrath against our evil was poured out on Jesus, we are empowered to dispense good to those that give us evil. We are freed from taking up offenses ourselves. This is not natural at all! The only way this can take place is if we are being transformed in the renewing of our minds. As a Christian, our whole being can be transformed with the truths of the gospel, so that we can respond to evil the way our gracious God does. Would you honestly and prayerfully look at how you respond to evil?